British lesbian dating app Dattch, which verifies that its users are indeed female-identified, is now expanding into the United States, starting with San Francisco and expanding to other American cities. Further plans are to expand into other major English speaking markets like Australia and Canada. Discovering Dattch was an interesting confluence of events. I downloaded Dattch after hanging out with LUDA at her apartment one night. She shared with me the fact that Dattch had very strong verification procedures (despite the fact men keep trying to join anyway), and given what she had put up with on other lesbian dating apps, she was pretty happy to see them used. She also remarked upon Dattch's decision to be trans-inclusive, and the language used in the verification procedures is clear. We created Dattch for a whole number of reasons but mainly because, we needed it and because no one had done it yet! The other lesbian sites we were using had all been created for men and no one had looked at what a woman would want to use in an app and how this would differ. Something actually designed around a female user and optimised for their behaviour. I found the use of "for" quite interesting, and I'm going to make an assumption here based on context (maybe it's another example of Britain and America, two nations divided by a common language?) that Exton is speaking to apps with male design teams. Now, for Brenda, this seems absolutely true. That app is designed by the same team as Bender. Spindle+ is Japanese only, but I'm pretty certain it was designed by members of the Japanese lesbian community (based on their staff list, which I read over). The quick dying Qrushr also seems have had this issue. We want to make it as easy as possible for women to talk and meet with new women, which doesn't mean looking for a quick hook-up in an app, it means creating profiles that are beautiful and enjoyable to create, uploading content that makes it really easy to start a conversation around and giving a helping had to get the conversation going when necessary. 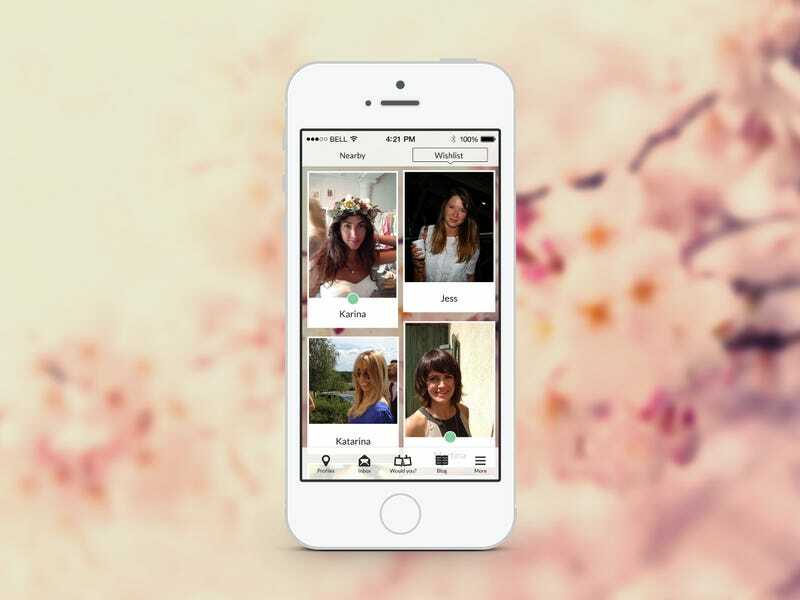 We currently verify that our users are female identified, so Dattch can be a space for them to meet each other in. We mainly use Facebook for this as it's the most scalable, manageable way to be get users on the app as quickly as possible. It's completely private (nothing ever gets shared back to your Facebook wall etc) and we simply use it to check a number of different items to verify if you are a real user and female identified. We ask users that really don't want to use Facebook or who don't have an account to email us so we can verify them over the phone. The main intention for Dattch has always been to create a space for female users, whether cis or trans*, it's a female orientated space and we would want any female identified user to be able to meet each other in the app. We launched in San Francisco in March 2014 and will be releasing in cities across America over the coming months. If you are outside of San Francisco you can still download the app and request for us to come to your area next. This genuinely decides where we focus our attention and if an area hits 2000 requests, we'll open it up immediately. After USA we'll be taking it to Canada and Australia and will then look to launch in other markets before the end of the year. As we grow and the business gets larger, we'd love to expand what we can offer for more audiences....Although we are currently only open for female identified users, we will be looking to expand this over the course of the year. Hmmm... Curious. Does this mean going the way of Bender and attempting a gay male app? A straight app? An app for everyone? An app which specifically recognises the links between the lesbian community and trans men? Genderqueer users added to Dattch? If one of the current app's strengths is in its ability to verify whether or not someone really is a woman looking for women, then it probably doesn't mean adding cisgender men. But I guess we'll just have to wait and see!